Kerri Steinberg and Jewish Mad Men keep rolling along…and the press is global! Home LAS Kerri Steinberg and Jewish Mad Men keep rolling along…and the press is global! 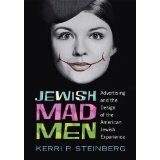 Since the 2015 publication of her book, Jewish Mad Men: Advertising and the Design of the American Jewish Experience, Kerri Steinberg has been busy giving presentations and interviews. The German Historical Institute asked her to present a paper at their Washington D. C. Conference on “Jewish Consumer Cultures in 19th and 20th Century Europe and America” so she headed to D.C. in May where the paper was extremely well received and she had the opportunity to spend several days with new colleagues from around the world. Continuing on the whirlwind tour, Kerri will be lecturing at the Jewish Museum of Maryland about her book and research on August 30, after which she returns to Otis and heads into a full teaching load.